Unlisted 1928 Atlanta LGS $500 Surfaces ! 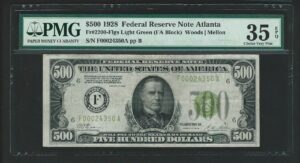 We were thrilled to have recently purchased an unlisted 1928 light green seal Atlanta District $500 Federal Reserve Note. The Standard Guide to Small-Size U.S. Paper Money by Schwartz & Lindquist lists only three known districts for 1928 light green seal $500s: New York, Chicago and Kansas City. Atlanta is not listed, and frankly, we’ve never seen one of these notes either, until now. Unlike Series 1934 LGS notes (where all serial numbers are low) serial numbers for 1928 LGS $500s are all high. The previously highest known serial number for the bank was F00023488A. The serial on the discovery note is is above xxx24000 putting it higher than anything else previously known and clearly into the LGS serial number range. As far as actual notes graded, PCGS has graded 0 (zero) 2200-F LGS notes and this is the 2nd 2200-F LGS graded by PMG. The other known PMG example grades EF 40 without EPQ .